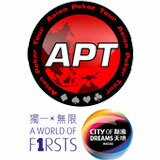 City of Dreams, in collaboration with APT, will host The Asian Poker Tour in Macau from Saturday to Sunday, November 6 to 14, 2010. The last leg of the Asian Poker Tour for 2010 and one of the biggest events in Asian poker is set to rock Macau for nine days offering a jam-packed schedule of poker events and tournaments at City of Dreams, an integrated entertainment resort that is the newest “must experience” destination in Macau. The festival of poker including a main event with a buy-in of HK$32,500 + HK$2,500 (approximately US$4,180 + US$320), will be staged for the first time at City of Dreams, a collaborator for the event. City of Dreams is an ideal venue for the event ever since the opening of Hard Rock Poker Lounge in June 2010, it definitely enhances the face of the Macau Poker scene and provides a sophisticated yet fun atmosphere designed with the players’ comfort in mind to attract the world’s top poker players as well as high-end bachelor parties and private events. Last year, online poker specialist Mr. Adrien Allain from France won his seat through a US$6 online qualifier, and then went on to take HK$3M (US$389,103) first prize from a total prize pool of almost HK$10M (US$1.3M) by becoming the APT Macau 2009 Main Event Champion. Visit the Asian Poker Tour (www.theasianpokertour.com) for the complete tournament schedule and details.